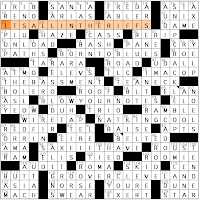 Robert W. Harris's Sunday New York Times crossword, "Colonization"
["O say can you see" or "Thru the perilous fight"?] is an ANTHEM LINE, playing on hem lines in clothing. [Resident of a military installation?] is a BASE TENANT. [Tropical fruit seller?] is a PLANTAIN DEALER, playing on "plain dealer." does anybody ever use this base phrase any more, or is it just the name of a cleveland newspaper? either way, i think this was my favorite of the theme answers. [Place to get drunk in the kitchen?] is a PANTRY BAR. i don't think i'm familiar with "pry bar." is that another word for a crowbar? [What overuse of a credit card might result in?] is a GIANT BILL. nothing to do with the oversized golden statue of president clinton recently unveiled in pristina, kosovo. [Gentleman's intransigent reply?] is "MADAM, I'M ADAMANT." okay, maybe this one was my favorite. [Where nitpickers walk on a street?] is a PEDANT XING. and an [Online beauty contest?] is a WEB PAGEANT. sort of like am i hot or not, i guess. [Pauses during speech: Var.] for CESURAS. first of all, it's caesura. second of all, the plural is caesurae. this one made me wince. [Like surveyor's charts] is PLATTED. PLAT as a noun is already a fairly odious piece of crosswordese to me; this is a step below that. [Most withered] for SEREST. same objection as PLATTED, x2. in comparison with those, ARETE, LIBELEE, RELISTED, NEET, and LPS don't seem so bad, but ... they're not good, either. just an unfortunate corner all around, especially considering it was all in service of by far the weakest theme answer, PANTRY BAR. [&&&&] is a strange clue, for sure. the answer is simply ANDS, which is actually not a great answer, but i think the clue makes it good. 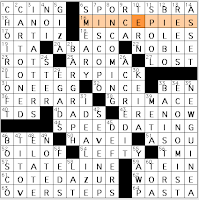 [Rice ___], five letters... this usually clues the (hideous) partial A RONI. not today; it's yummy PILAF instead. [College world] is ACADEMIA. i somehow have never managed to leave it, except for a one-year stint in a dot com. pet peeve: people who rhyme this word with "macadamia." you see the E there? it's pronounced like an E.
two clues i could have done without: [Brand with a pyramid on the package] for CAMEL and [Back-room cigar smokers, say] for CRONIES. smoking = yuck. more humped beasts of burden, please. that's all for me, at least until the MGWCC blog post on tuesday. i'll see you in the comment box. 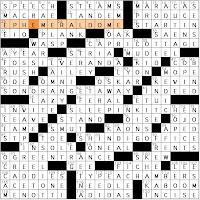 Merl Reagle's syndicated crossword, "Like, Totally Jazzed"
• 23A. [Jazz guitarist's admission?] is IT'S ALL IN THE RIFFS ("it's all in the wrist"). • 40A. [What lifelong jazz musicians are?] is BORN TO BLUES ("born to lose"). • 56A. [Name for a jazz club?] is THE BASSMENT ("the basement"). • 69A. [Play clarinet?] is BLOW YOUR NOTES ("blow your nose"). • 84A. [Jazz crooner?] is NAT KING COOL ("Nat King Cole"). • 98A. [Where to buy jazz instruments?] is SAX FIFTH AVE. ("Saks Fifth Avenue"). • 118A. [Our jazziest president?] is not saxophone-playing Bill Clinton, it's GROOVER CLEVELAND ("Grover Cleveland"). • 16D. [Name for a jazz revue?] is SNAP, CRACKLE, BOP ("Snap, crackle, pop"). • 51D. [Like jazz movies?] is MELLOW-DRAMATIC ("melodramatic"). • 48D. [Fish made of vitamins?] is the not-so-well-known DACE. I used the crossings to pin down DACE after asking myself if there was a vitamin H for HAKE. Vitamins A, B, C, D, E, and K were the letter bank for the fish name. • 65A. [Big name in skis and snowboards] is ELAN. I originally had EBAN crossing SNAPCRACKBEBOP. • 80D. [WWI Treasury secretary William] MCADOO. • 87A. [Large evergreen, ironically] clues RED FIR. Is it "ironic" if an evergreen has red in its name? I don't think that's irony. 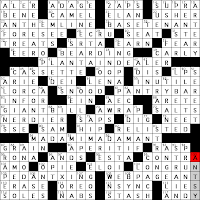 James Sajdak's syndicated Los Angeles Times crossword, "What's Yours?" • 25A. [The barber ordered a __] VODKA TONIC. Barbers slap some tonic on a man's face sometimes, right? • 27A. [The heating contractor ordered a] BOILERMAKER. That's a whiskey shot with a beer chaser. • 40A. [The farmer ordered a] PLANTER'S PUNCH. What's in that? Rum, lime juice, carbonated water, and sugar. Sounds good. • 60A. [The popcorn producer ordered a] HOT BUTTERED RUM. If you buy microwave popcorn, go for brands that don't use diacetyl flavorings—those cause lung disease in the people working at the popcorn factory. • 84A. [The orthopedist ordered a] SINGAPORE SLING. Gin and cherry brandy? That sounds gross. • 102A. [The high roller ordered a] SEVEN AND SEVEN. Some sort of whiskey plus 7-Up, I think. • 119A. [THe handyman ordered a] SCREWDRIVER. Vodka and OJ, for your vitamin C and potassium needs. • 123A. [The citrus grower ordered a] FUZZY NAVEL. OJ (the "navel") with peach schapps (the "fuzzy"). • 66D. RIFFLES is [Mixes, as cards]. Less mixing than a full-bore shuffle, right? • 112D. [Where to get down] is from an EIDER. • 13D. ASK FOR IT means to [Invite trouble]. • 30A. A REF is a [Whistling zebra?]. • 75A. HANG-UPS are [Emotional problems]. Randolph Ross's CrosSynergy/Washington Post "Sunday Challenge"
I'm not sure why the CS team calls it a "Sunday Challenge" when its difficulty is often on a par with the weekday themed offerings. If it's clearly labeled as a challenge, why not toughen the clues up a notch? • 1A. [Informing secondarily, for short] is CCING. • 16A. [Baked goods at an English Christmas] are MINCE PIES. • 28A. [Top draft selection in the NBA, e.g.] is a LOTTERY PICK. • 31A. [Small breakfast] clues ONE EGG. No, this answer does not rise to the level of an "in the language" unit of meaning. • 52A. [Words before Olay or vitriol] are OIL OF. "Oil of vitriol"?? • 54A. [Truman, Clinton, Reagan, or Obama, e.g.] clues a LEFTY, or left-handed person. • 1D. [Where to hear church music] is the CHOIR LOFT. But don't people hear the music from everywhere else in the church? • 35D. [Second largest island in the world] is NEW GUINEA. • 37D. [Put on a pedestal] clues IDEALIZE. I wanted IDOLIZE(D), but COTE D'AZUR's Z said no. • 47D. [Cosmonaut Gherman or Vladimir] TITOV? Never heard of either one. Emily Cox and Henry Rathvon's Boston Globe crossword, "Interior Hues"
I liked this kind of theme better when it's a little tighter, as when they had contrived phrases with hidden gemstones. Here, the first hidden-color entry is EPHEMERAL DOME, with a hidden EMERALD, and that one's good. But there's practically no limit on made-up phrases in which you could find a hidden RED, so VAMPIRE DEN did nothing for me. The embedded colors in the theme entries also include apricot, silver, orange, pink, indigo, green, peach, amber (another gem), and teal. It all feels kind of loose—the colors don't form a logical set (as the seven colors on the ROYGBIV spectrum would), and there's no particular logical order in which they're presented. Favorite clue: [Bacon with links?] for "Six Degrees of KEVIN Bacon."